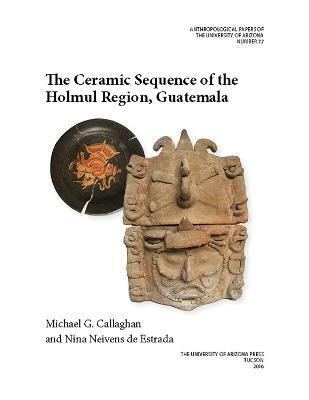 Sequencing the ceramics in Guatemala s Holmul region has the potential to answer important questions in Maya archaeology. The Holmul region, located in northeastern Guatemala between the central Peten lowlands to the west and the Belize River Valley to the east, encompasses roughly ten square kilometers and contains at least seven major archaeological sites, including two large ceremonial and administrative centers, Holmul and Cival. The Ceramic Sequence of the Holmul Region, Guatemala illustrates the archaeological ceramics of these prehistoric Maya sites in a study that provides a theoretical starting point for answering questions related to mid- and high-level issues of archaeological method and theory in the Maya area and larger Mesoamerica. The researchers ceramic sequence, which uses the method of type: variety-mode classification, spans approximately 1,600 years and encompasses nine ceramic complexes and one sub-complex. The highly illustrated book is formatted as a catalog of the types of ceramics in a chronological framework. The authors undertook this study with three objectives: to create a temporal-spatial framework for archaeological sites in the politically important Holmul region, to relate this framework to other Maya sites, and to use type: variety-mode data to address specific questions of ancient Maya social practice and process during each ceramic complex. Specific questions addressed in this volume include the adoption of pottery as early as 800 BC at the sites of Holmul and Cival during the Middle Preclassic period, the creation of the first orange polychrome pottery, the ideological and political influence from sites in Mexico during the Early Classic period, and the demographic and political collapse of lowland Maya polities between AD 800 and AD 830." Michael G. Callaghan is an assistant professor of anthropology at the University of Central Florida. He is co-director of the Holtun Archaeological Project, located in the department of Peten, Guatemala. Nina Neivens de Estrada is a doctoral student at Tulane University. She specializes in ceramic analysis and excavation of monumental architecture. Her research focuses on the typological and modal analysis of early lowland Maya pottery in the central Peten area."